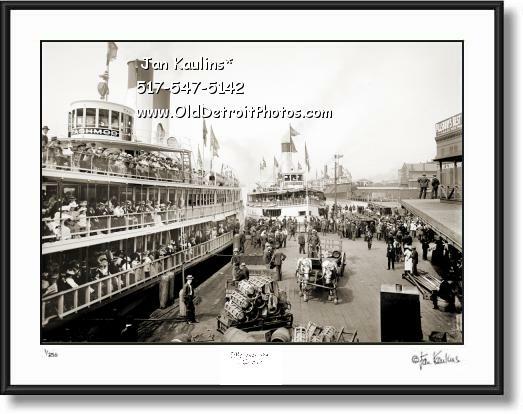 TASHMOO DETROIT EXCURSION STEAMER photo print photograph picture for sale. This TASHMOO DETROIT STEAMSHIP sepia toned restored black and white photo picture print is made from the original black and white vintage historic image of this steamer at dock on The Detroit River in Detroit, circa 1910. " The Tashmoo was a sidewheeler steamboat on Lake St. Clair and Lake Huron. It was famous for being one of the fastest ships, at the time, on the Great Lakes. The Tashmoo was the first ship constructed in 1900 and was launched on December 31, 1899. It was built by the Detroit Shipbuilding Company in Wyandotte, Michigan for Detroit's White Star Line. The Tashmoo was nicknamed the "White Flyer" and, because of the number of windows on the ship, the "Glass Hack." The Tashmoo's regular route was from Detroit to Port Huron, Michigan. It made several stops along the way, including at its namesake, Tashmoo Park. On December 8, 1927, the Tashmoo snapped its moorings during a gale and starting drifting up the Detroit River. It collided with a ferry and was found further upstream, stopped by the Belle Isle Bridge. Two tugboats pulled the Tashmoo away from bridge, but the cables broke again and the ship once again headed for the bridge. The ship was 10 yards away from the bridge before the tugboats were able to get the Tashmoo secured again. The ship was eventually repaired. On June 18, 1936, the Tashmoo struck a submerged rock as it was leaving Sugar Island. The ship was able to dock in Amherstburg, Ontario and be evacuated before it sank in 18 feet of water. It was eventually scrapped. It was entered into the National Maritime Hall of Fame in 1985." This is a wonderful historic photo of The Tashmoo filled to the brim with passengers. In line behind it is The IDLEWILD and another excusion steamer behind it. THESE BLACK AND WHITE DETROIT PHOTO ART PRINTS ARE VERY HIGH QUALITY REPRODUCTIONS OF ORIGINAL OLD VINTAGE HISTORICAL DETROIT PHOTOGRAPHIC PRINTS. THESE SEPIA TONED BLACK AND WHITE DETROIT PHOTO PICTUE PRINTS ARE OFFERED FOR SALE HERE FOR THE VERY FIRST TIME. THEY HAVE BEEN MADE FROM ORIGINAL NEGATIVES OR ORIGINAL FIRST GENERATION PRINTS, MANY OF THEM ARE 50 YEARS OLD AND SOME DATE TO THE EARLY 1920's AND 1930's. THE RARE OLD DETROIT ORIGINAL PHOTOS AND BLACK AND WHITE NEGATIVES USED FOR THESE PRINTS HAVE BEEN OBTAINED FROM HISTORICAL SOCIETIES, NATIONAL ARCHIVES, THE LIBRARY OF CONGRESS AND NUMEROUS PRIVATE COLLECTIONS. IT HAS TAKEN SEVERAL YEARS TO PUT THESE OFFERINGS TOGETHER ON THIS WEBSITE. MANY OF THESE PHOTOS ORIGINALLY CAME FROM OLD DEFUNCT NEWSPAPER AND MAGAZINE ARCHIVES, WHERE THEY WERE USED ONCE FOR A STORY AND THEN USUALLY JUST THIS ONE ORIGINAL PRINT WAS MADE AND KEPT FOR THEIR ARCHIVES. HENCE, THESE HISTORICAL IMAGES WERE NOT ORIGINALLY MADE TO BE FOR SALE, BUT WERE TO BE USED AS IMAGES FOR NEWS STORIES AS THEY UNFOLDED--MAKING THESE IMAGES EXTREMELY RARE HAVING SURVIVED SO MANY YEARS. VERY FEW OF THESE IMAGES HAVE EVER BEEN OFFERED FOR SALE TO THE PUBLIC UNTIL NOW.